The world created by author J.K. Rowling is an astounding achievement of the human imagination. Although, she lends from the myths and legends of Europe as well as other ancient civilizations extensively, she deftly weaves them into her own tale. This lending of legends already known to vast sections of differing population groups this only adds layers of rich depth asking the reader to delve further than the story before them. Numerous official and unofficial works have been published exploring the mythology that inspires much of the Harry Potter novels. These deal with topics such as the bestiary of the world to the significance of the characters names. Sadly, two of the houses of Hogwarts are often overlooked. Those being House Hufflepuff and Ravenclaw. This may be due, impart, to very few of the main protagonists coming from both these houses, with the vast majority coming from either house Griffindor or Slytherin. The following article will hopefully enlighten the reader as to the history and features of both houses. One of the most endearing facets of the books written by Rowling is that each house has dominant character traits that each house historically values. These will also be covered below. House Hufflepuff’s badge is the badger and their colors are yellow and black (Harry Potter Wikia 2017). House Hufflepuff may have been looked down at but the more ambitious in Slytherin or those in noble Griffindor, but the traits of patience, loyalty, hard work, friendliness, and impartiality would be more than admirable in any friend you might have. Draco Malfoy mentions of Hufflepuff wizards, “Imagine being in Hufflepuff, I think I’d leave, wouldn’t you?” showing disdain typical of the treatment they get throughout the novels, but certainly placing them as admirable underdogs (Pottermore 2017). That they lack in ambition or faultless courage cannot be considered to be a black mark against them when their list of admirable qualities seems almost as long as famous wizards from other houses. 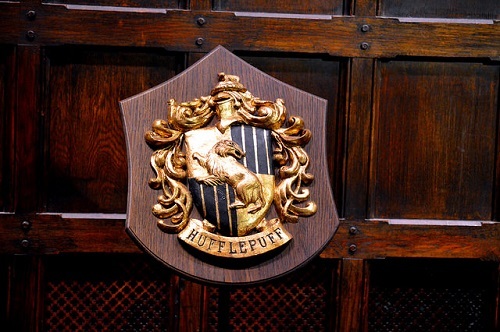 The Hufflepuff founder was Helga Hufflepuff, one of the four founders of Hogwarts with Godric Gryffindor, Salazar Slytherin, and Rowena Ravenclaw. In the novels and numerous other additions to the Harry Potter canon, Helga Hufflepuff was a medieval witch living in the 10th century. She is believed to have come from modern day Wales. The Sorting Hat, the magical item that places each student in their respective houses by magically determining their character traits, confirms Wales as Helga Hufflepuff’s birthplace by stating “…from the valley broad.” (Harry Potter Wikia 2017). The Welsh are often referred to as coming from the Valleys. She was known for treating all students fairly and equally and admitted students from diverse backgrounds. One of her key teaching philosophies was to accept all and teach them all she knew. She chose students who were loyal, fair and not afraid of hard work. These were to become the prime traits the sorting hat would look for in aspiring students. One of her biggest contributions to the founding of Hogwarts was the establishment of the great kitchens which still use her recipes to the modern day encapsulated in the novels. She was extremely talented in food based charms and thus found a home in the kitchens feeding the students (Harry Potter Wikia 2017). An example of her kindness and the values she wished to impart on students of her house was the employment of house elves to the kitchens. This provided them with a safe and fair workplace for the often maligned and servile race (Harry Potter Wikia 2017). All the houses have their respective house ghosts, similar to schools mascots only they are ghosts with the ability to glide through walls or cause mischief if they so choose. The house ghost for Hufflepuff is the Fat Friar. Little is known about the exact date of his birth but he was one of Hogwarts first students sometime in the 10th century (Harry Potter Wikia 2017). He was placed in Hufflepuff and after his schooling became a practicing priest. His kindness and goodwill would be his undoing as he was executed because muggle, non-magic people, churchmen grew suspicious when he was able to cure people with smallpox by just poking them with a stick. That and he kept on pulling rabbits out of the communion cup (Harry Potter Wikia 2017). He returned to Hogwarts as a ghost and has since been the Hufflepuff House ghost. The house still maintains the same value system that Helga Hufflepuff wished to implement. The current head of house in the novels is Pomona Sprout the professor and the Head of the Herbology department (Harry Potter Wikia 2017). The house commons room is in the basement near the kitchens and students need to know the password to be allowed entrance. If they get this password wrong they are doused in vinegar. Perhaps the most famous Hufflepuff would be the recent main protagonist from the recent film Magical Beats and Where to Find Them, Newt Scamander. The film is based off of a textbook the students in the Harry Potter novels require written by Newt Scamander. Interestingly, Scamander never completed his studies and was expelled from the school. The house colors are blue and bronze with the emblem being an eagle. There is sometimes a lot of competition between Ravenclaw students in academics. However, on the whole, they can be reliably seen to be a voice of wisdom within the school (Harry Potter Wikia 2017). Hermione Granger was seriously considered to be placed in Ravenclaw rather than Gryffindor by the sorting hat, thus emphasizing the traits looked for in potential Ravenclaw students. The house ghost of Ravenclaw is the Grey Lady, who is, in fact, Helena Ravenclaw, Rowena Ravenclaw’s daughter. This story is one of the more tragic back stories in the Harry Potter universe. Upon Helena running away to Albania, Rowena sent the Bloody Baron, who loved Helena, to bring her back to the British Isles. Helena refused and the Bloody Baron in a rage killed her and he later committed suicide due to the guilt and sorrow. Helena’s ghost returned to Hogwarts to eventually become the house ghost of her mother’s house (Harry Potter Wikia 2017). The house still maintains its original value set and promotes intelligence and wit. The house head is Filius Flitwick who is also the Charms Master at Hogwarts (Harry Potter Wikia 2017). Entry into the commons room unlike the other houses is not done with a password, rather the student must solve a riddle. Modern students who feature in the novels and are members of Ravenclaw are Luna Lovegood and Cho Chang. The common room has a light airy feel and is situated in one of the towers of Hogwarts castle (Harry Potter Wikia 2017) The house is traditionally welcoming of eccentricity, perhaps why Luna Lovegood was chosen and perhaps its most famous past student Uric the Oddball who famously wore jellyfish as hats. Although the two houses mentioned above are not the most popular houses in the novels, they provide for a richer mythology for the Harry Potter universe. Perhaps more importantly, they provide differing sets of values we all could learn to appreciate more. Christopher Bates. "Difference Between Houses Hufflepuff and Ravenclaw." DifferenceBetween.net. February 23, 2017 < http://www.differencebetween.net/miscellaneous/difference-between-houses-hufflepuff-and-ravenclaw/ >. The article indicates Ravenclaw crest includes an image of an eagle; the image is of a raven.